2nd Lt. Spenser Rapone recently came under scrutiny for posts of socialist and communist content online. 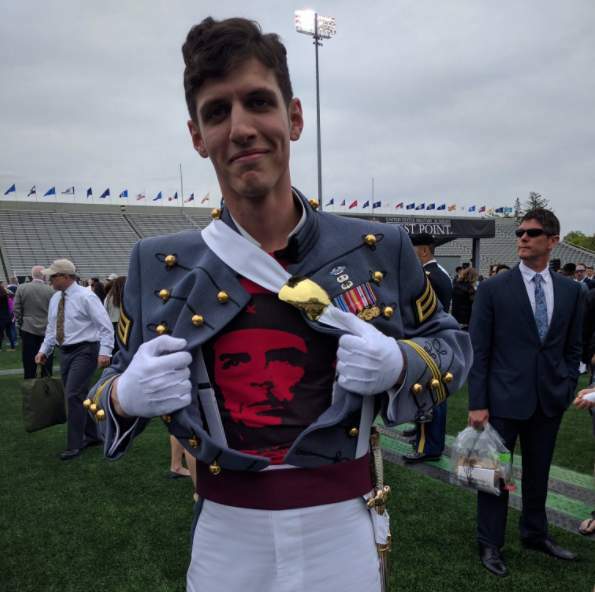 Florida Senator Marco Rubio has called on the U.S. Army to remove 2nd Lt. Spenser Rapone, a West Point graduate and infantry officer who recently came under fire for his posts of socialist and communist content on social media. Rubio says the Army should nullify Rapone’s commission, pursue all disciplinary action and require Rapone to pay back the cost his education, and that West Point should consider revoking his degree. “As you may know, Rapone has publicly and vulgarly derided the secretary of defense, advocated for communism while in uniform and political violence in general, and expressed support and sympathy for enemies of the United States, including Chelsea Manning, a convicted traitor. This clearly violates multiple Army regulations and the Uniform Code of Military Justice,” the Republican senator wrote in a letter this week to acting U.S. Army Secretary Ryan McCarthy. After posting the photo, Rapone was discovered to be a vehement Communist propagandist and “official socialist organizer.” Rapone’s social media was filled with up to hundreds of posts, messages and photos that were being circulated around the military and civilian communities. His Twitter account is now set to protected, and his Instagram account has been taken down. His Facebook, where he goes under Giuseppe Impastato, is private. Rapone had also posted a second photo of himself in uniform, and he is seen wearing a Che Guevara T-shirt underneath his uniform jacket. Guevara was an Argentine Marxist revolutionary who believed the poor people of Latin America would be saved by communism. Rapone is a 2LT (Second Lieutenant) and an infantry officer in the 10th Mountain Division at Fort Drum, N.Y. He has deployed to Afghanistan and received a combat infantryman badge (CIB). “Additional posts on social media by Rapone broadcast his devotion to the communist cause and his plans to infiltrate and sabotage the military. His conduct, writings, and sympathies for American adversaries predates his commission in the Army. Therefore, I respectfully request the United States Army immediately nullify Rapone’s commission and pursue all available disciplinary options under the Uniform Code of Military Justice. Rapone should be required to pay back in full the cost of his education and the United States Military Academy should consider revoking his degree,” Rubio wrote this week. It is extremely concerning that someone who so often expressed such hostile views towards the United States’ system of government was able to obtain a commission. Rapone’s revolutionary ideas were harbored long before he was commissioned as an Army Second Lieutenant. Were West Point administrators or faculty aware of his views and behavior? While I strongly believe academic institutions must respect the exchange of ideas and allow students to voice their opinions, members of the military who harbor anti-American views and express their desire to harm our country and its leaders are unfit to serve and defend our nation—and certainly should not enjoy the privilege of attending or graduating from an institution such as West Point, a taxpayer-funded military academy. This is clearly not just a matter of law but also of common sense, and I can only assume Rapone’s unchecked behavior is an extreme embarrassment for the United States Army and the United States Military Academy. Please provide me with all relevant information regarding West Point’s efforts to ensure cadets who actively support the destruction of our government do not waste more taxpayer funds or prevent a more worthy candidate from attending an institution like the United States Military Academy. The Army’s premier officer commissioning source must ensure an individual like Spenser Rapone is never given the opportunity to lead or serve beside American soldiers. The senator asked that the Army have a response within 30 days. The Army said that the appropriate command authorities would review Rapone’s situation.